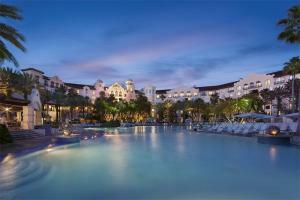 Universal's Hard Rock Hotel, famed for being one of the coolest hotels on the planet. Live like a rock star and savor the perks of rock ‘n’ roll royalty with impeccable surroundings, laidback luxurious style and show stopping service. Supremely talented chefs offer culinary nirvana from a famed steakhouse to delicious American classic cuisine. The sweeping California mission style design inspired by classic rock music welcomes you to escape to a sensational world with a palm lined swimming pool featuring underwater music, incredible rock memorabilia and exceptional entertainment including famous names live in concert. Plus, hotel guests receive exclusive theme park benefits including Free Universal Express℠ Unlimited ride access* to SKIP THE REGULAR LINES in both theme parks all day. Located in the heart of Universal Orlando. Palm Restaurant, The Kitchen, Velvet Bar, Hard Rock Cafe.